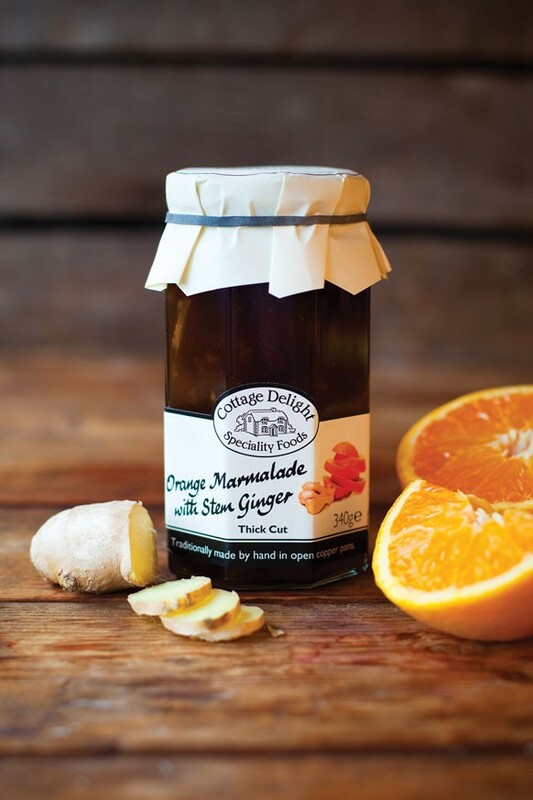 Cottage Delight's Orange Marmalade with Stem Ginger is a rich and fruity, thick cut marmalade spiced with stem ginger. This extra zesty, orange marmalade is made using the finest Seville oranges and whole, mini pieces of stem ginger in syrup for a luxury texture and flavour. Traditionally handmade in open copper pans, all our marmalades are developed in our Kitchen and lovingly prepared in the Stafford Moorlands, in small batches, using only the finest quality fruit and zest. Cottage Delight's Orange Marmalade with Stem Ginger is delicious on crumpets or as a glaze for roast ham. No artificial additives. INGREDIENTS: Sugar, Seville oranges (28%), Stem ginger in syrup (8%) (Stem ginger, Sugar, Water), Muscovado sugar, Lemons (4%), Citric acid, Concentrated lemon juice, Ground ginger, Processing aid: Salted butter (from Milk).